The original publishing date of today’s article was back on July 28, 2016. I wanted to pull this article out of the archives because I felt with the new year in full swing that you needed to hear it especially if you happen to be in an off season with a sport or competition. If you’re committed to making yourself better by enhancing your fitness, or athletic development then you should never make excuses. This is particularly true if you find yourself in a situation where you may not have access to a gym, or a lot of equipment. This is why you need to read today’s article. Read and apply! I remember hearing this quote once that was referencing how to come out on top during competition. It was in reference to being successful. The quote said “You only have to work a little harder than the next guy. You only have to work a little smarter than the next guy.” I don’t recall the origin of this quote, but despite its obvious nature the truth is very loud in this statement. As a strength coach the thing that often surprises me are the summer months with many athletes that are out of season without any training formula to follow. There have been many occasions where I would get a request to formulate and execute a strength and conditioning program for a variety of athletes that would be looking to get ahead during the summer months. It’s been during this time that I’ve discovered on many occasions that these athletes didn’t have a conditioning plan, or an effective system in place to help guide them in the right direction towards getting physically and mentally prepared for their sport season. The thing that is shocking about this is that many of these athletes were collegiate level and I’ve even had a few pros in the mix as well. What I’ve found is that even when helping many of these guys and girls they were surprised as to how much we could do with so little equipment. The reason that I found we could be so impactful is because I was able to implement effective athletic conditioning drills for them to meet both their individual needs and the needs of their relative sport. The key is being able to recognize what one is in need of improving. This is why a simple plan of conditioning can be so effective. As a strength and conditioning coach when looking at such a plan I want to address the fundamental technical aspects of movement, as well as teaching a trainee what drills to apply to make them more effective in their sport and life. To start I always like to go over the basic mechanics of sprinting. After all, being able to sprint (even if it’s for a short burst distance) is necessary for most any sport situation. Of course the mechanics of this coincides with being able to sprint more effectively in a straight line, or in the sagittal plane. This should be inherent in every athletically driven conditioning program. This is fundamental to athletic development and just having a body that is built for performance. Of course if you don’t have access to three cones you can easily substitute another marker for the purpose of the drill such as some water bottles, pieces of tape, rocks, blocks of wood, or whatever you can come up with to make it work. The point is that the value doesn’t necessarily come from the equipment, but rather the application of the training knowledge. Thirdly, the transverse plane of motion is also crucial for the purpose of covering your bases in the development of a solid athletic conditioning plan. Once again the the process doesn’t have to be complex. It can be simple in nature, but challenging to perform. Remember that simple doesn’t mean easy. 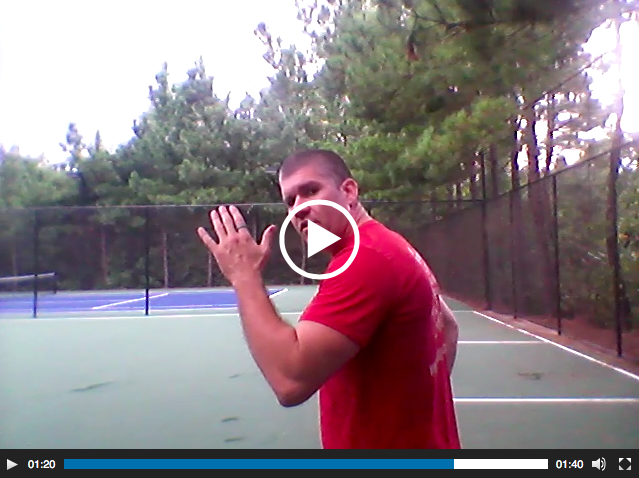 This is a great drill for digging into the transverse plane (rotational movement). This lumbar hip twist on the agility ladder will get you proficient in rotational movement. If you don’t have access to an agility ladder you can utilize tape and chalk to mark out your ladder. This is a simple adjustment to allow you to perform this particular movement. The value of this drill is that it closes out the last plane of motion. This helps to ensure that you have a more complete athletic conditioning plan. With sprinting, the three cone lateral shuffle, and this drill you are covering all three planes of motion. The point here is that you don’t need access to a lot of “stuff” in order to be effective. The best conditioning plan is the plan that has a simple structure. This is highly effective in its purpose to physically prepare you for your relative sport, or life event. What type of conditioning are you currently including in your athletic fitness program? next post: What Life Habit Can You Do 20 Minutes Daily To Improve Your Life In 30 Days?